PAL is an acronym for "Power and Loan". The Eoto Portable Port PAL charging station which has so many accessory and configuration options, is barely a standard machine. What it is expected to standardize are the expectations of service of those who see it, and what others will come to expect from Port PAL owners and Eoto-Co-op members. 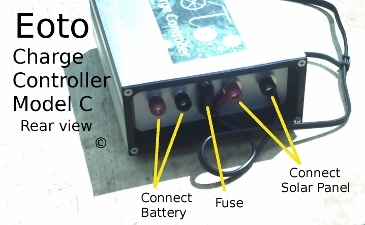 * Roll out in the sun for free 3 amp trickle charge for each of two separate 12 volt DC batteries. Set the rooftop solar panels to tilt for maximum sun and park your small equipment or stack your batteries underneath. The Portable Port PAL is made of heavy aluminum with stainless steel fasteners for years of clean and nice looking mount for the sign which indicates that you are a Co-op member. Your personal Eoto-Co-op member email address is prominently displayed in large letters on two sides. * Portable Port PAL comes with it's own wheels for easy movement to garage (or even into the apartment - overall assembled dimensions are 6'5"high x 2'4"wide x 7'6"long) for night security or to protect solar panels from high winds and hail leaving only the small flagged ground rod for passers by who are looking for an Eoto-Co-op member. * The basic Port PAL comes standard with fused charge controllers with voltage indicators and connectors for charging multiple devices with 5 volt USB connectors and 3v. 6v. & 12v. sources. Excellent way to charge and maintain the standard Eoto 24v battery pack, and many other equipment brands including lawn and garden equipment, scooters and bikes, mobility chairs, cars, trucks, tractors and more. * The basic Port PAL also comes standard with The BatteryTuner Tool Kit containing 2 models of the BatteryTuner and an array of connectors and adapters for different applications. Model S is a stand-alone device that will rejuvenate 'dead batteries' and maintain any 6 or 12 volt lead/acid battery for a longer life span. This model of BatteryTuner will work using the battery's own power, or can be used in parallel with the solar charger or other chargers. The Model B BatteryTuner is a fully automatic maintenance and diagnostic tool that is combined with a multi-stage AC to DC charger. * All Eoto Co-op members receive data and communications services from the Co-op including email and email forwarding, service advertising, data base management and sharing for battery and parts swapping and more..
* The Port PAL owner is optionally enrolled in the Eoto Express service which maps locations of Eoto Port PAL stations, provides template agreements for battery charging and battery swapping services, and offers excellent tools for battery tracking and record keeping. * Of course the Port PAL owner will also have all of the other benefits of Eoto-Co-op membership including income opportunities for new member recruiting, for new innovation and testing and for capital investment. 1 - BatteryTuner Tool Kit with 1 - Model S: Input 4.5-16VDC 45mA ; Output 60V pulse .8 – 1.2 KHz. ; and 1 - Model B: Input 120VAC 3A ; Output 60V pulse .8 – 1.2 KHz. ; 13.5VDC 2A,8A,12A ; Auto charger ; Auto diagnostic ; Battery level indicator ; Temp controlled cooling fan ; Auto battery maintainer. And the BatteryTuner Tool Kit comes with several extra cables and connectors for common applications which includes a set of heavy duty booster jumper cables: Red + and Black - with heavy zinc coated steel clamps and copper teeth; Stranded copper wire size: 2 gauge; Length 20 feet; 500 amp. A Portable Port PAL is a standard Eoto machine and Eoto-Co-op project. To purchase any Eoto machine a Parts Deposit of an additional 25% of machine cost is required. These funds are applied to your Roll-over account which is explained in the Co-op member's manual. It has been compared to the purchase of an 'Extended Warranty' and to a 'Rebate' but neither of these terms is correct because they do not describe the 'Savings' aspect. This account can be used to pay for replacement machine parts during the first year and will accumulate from Eoto-Co-op Roll-over disbursements - (10% of the amount of every machine sold by all Co-op members is disbursed proportionately to the amount in your account). This system is designed to support the Co-op and encourge you to leave your funds in the account at the end of a year when you have the option of cashing out. 3. Co-op membership is included and there is no additional cost for this, but your contribution to the project is desired, and the minimum requirement is that your machine be maintained to original standards for as long as you display or show your machine. 6. Sales tax is paid when machines are picked up at a Distributor's location, or when shipped to a state where a Distributor is located except when presented with Buyer's agricultural exemption. Obtain and study a copy of the Eoto-Co-op membership policy. Get this through your Accedtor. PPP has wheels on one end. Other end is Lift handle end. The copper coated steel ground rod is included for extra electrical safety protection and stabilizing one PPP leg when clamped in place. Fasten foot to one leg of Lift handle end. Check the area for buried pipes and lines. Water pipes, gas pipes, electrical service lines, telephone lines, sewer lines, drainage tiles, etc. - all of these could be seriously damaged and/or dangerous if penetrated by a driven ground rod. Drive copper coated steel ground rod into ground 5 feet (leave 2' above ground). Slip Eoto flag over the top of the rod and slip worm gear hose clamp through holes in bottom of flag and tighten to ground rod; (be sure to leave protruding parts of clamp facing away from the side that PPP leg will clamp against). Use 2 U-bolt clamps with 4 wing nuts to fasten ground rod to PPP Lift handle end leg that does not have the foot. Park on level ground when possible. Excavate the normal spot if necessary. If ground is low or sometimes wet, it is recommended that a mound be created. If parking on a hill, always keep rain cap end higher to keep rain water from running under the cap. Do not place ground rod in or near areas with vehicle traffic, or in the direct pedestrian paths. Grounding may not be necessary for many PPP applications, but connecting with ground wire to remote ground rod - all should be buried, or the flag waving rod should be tight against a building or permanent structure. For mount security (consider grounding separately) when normal parking spot is a hard traffic surface, install surface level sockets (as in: large pipe sleeve installed flush with driveway surface, and smaller insert pipe clamped to PPP leg). Place where visible from highest traffic road. Email banners should be perpendicular to road when possible for display to oncoming traffic in both directions. Normal tilt of the solar panels will be to the short side of Port PAL but modifications should be made to track the sun when the signs do not face the road properly. When working around the PPP it may be convenient to rotate the stand around the ground rod during the day to track the sun. Your Portable Port PAL is easy to move, so for small lots with trees, to get maximum power you may wish to prepare more than one spot such as tracking the sun on one side of the tree in the morning, and moving to the other side in the afternoon. It is recommended that grass be kept cut where the wheels are regularly parked to 2 to 3 inches high. Do not park the Port PAL in grass exceeding 7 inches high. Do not park near dry grass or vegetation at risk from spark and flame. Keep batteries and all electrical connections at least 24 inches above and away from any grass or vegetation. All clamp-on wiring connectors whether in use or not, should be fastened to swing free of all metal and vegetation when un-hooked. PPP parked in areas that may have animals such as pets or varmints should be equipped with a security cabinet for all batteries, equipment and wiring. This also applies to areas with access by children and yes, even adults who are not Co-op members. Do not underestimate the foolishness of adult passers-by and neighbors, and do not put it beyond the kids playing ball next door to climb your fence. PPPs that are monitored from a distance and open to air equipment can be just the spot selected for a bird's nest. We use a rubber snake to solve this problem. Works to repel squirrels too. It is not recommended to mount a fire extinguisher on the PPP unless using an opaque cabinet; however inside vehicles that are charging at the Port and just inside the door of the nearest building are good placement choices. The Portable Port PAL is not recommended for duty requiring plumbing connections. There are several configurations of the Permanent Port PAL that will do these duties. When AC power is required at the outdoor PPP parking, buried conduit with rising weather tight outlet box is recommended. Cords that are stretched from a building should be a minimum of 12 ga. copper with ground fault interrupt. The tilt of the solar panels can be adjusted from flat on top to 80 deg. For high tilt and in windy areas, additional tie downs or permanent leg sockets will be required. If using stakes and guy wires, make sure they are brightly colored and marked with flags. Batteries, Controllers, BatteryTuners, and other components should be placed or mounted on shelf with at least 3 inches air space between them. If stacking is required, use a wire rack with at least 6 inches above and below each component. Direct sunlight can increase the heat on these items considerably, but solar powered cooling fans work when they are needed and are a recommended option when there are more components than will fit on the protected shelf. Handling these cords and batteries will expose you to lead. Wear gloves. Wash hands after moving the PPP or handling any of it's components. Keep opaque cover over the solar panels when moving the PPP. Keep opaque cover over the solar panels when the DC power is not in use. Do not focus light on panel. Do not use a damaged solar panel. If wiring insulation is damaged or weathered, glass is cracked, or housing is opened, correct before further use. Each Controller Model C has 3, 6 and 12 Volt DC plugs. Plug the appropriate plug on the Multi-Adapter into the appliance. Insert the plug on the other end of the wire within the appropriate DC Outlet on the Charge Controller. Activate your appliance. CAUTION! Only one appliance can be used at a time with each Controller and the adapter must be plugged into the proper voltage output. To charge cell phone or other small electronic item, plug the item’s power cord into one of the USB Ports on the front of the Controllers. Use the Outputs marked "Inverter" and the 12V Female Output ports to connect the male adapters for 12V accessory items that need to be charged. To recharge a 12 volt battery, while paying attention to the proper polarity (black (-) is negative and red (+) is positive), connect the two ring terminals on the Battery Clamp to the Battery Terminals on the back of the Charge Controller. Connect the black clamp to the black or negative (-) terminal on the battery. Finally, connect the red clamp to the red or positive (+) terminal on the battery. Avoid accidental contact of the red and black battery clamps to each other. Turn on the Charge Controller at the On/Off switch. The voltage display will have to be turned on in order to monitor the battery voltage. (Press the Voltage Meter Switch to turn off the Voltage Meter when not monitoring the battery voltage since it consumes energy.) Twelve (12) Volt batteries should charge to 13 Volts for a full charge. To stop charging the battery, turn Power Switch to OFF and disconnect the solar panels from the Charge Controller. 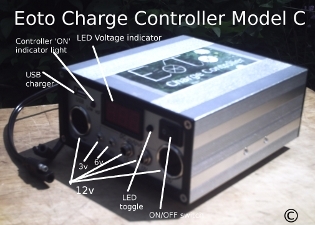 The Charge Controller provides “overcharge” protection. If the battery voltage is higher than 14.5 V, the regulator will shut off charge from solar panel. a. Over-discharge Protection: When the electricity level of the battery goes too low (below 11 volts) from product usage, the Charge Controller will automatically shut off the power output to prevent damage to the battery and appliances. If this occurs, stop using the battery and charge it until the Voltage display shows 13 volts. b. Overcharge Protection: If the electricity level on the battery goes too high (above 14.5 volts) the Charge Controller will automatically shut off power input to prevent damage to the battery and appliances. c. Overload Protection: Each Controller has a 4 amp fuse (8 amps for two controllers) If the output exceeds this current the fuse will blow to prevent damage to the Charge Controller and appliances. The On/Off switch of a Charge Controller must be in the “On” position to activate the three protection functions mentioned above. Keep the Solar panels clean. Wear electrically insulated gloves and safety goggles. Dry solar panels and wiring thoroughly. Cover solar panels with opaque cover. Clean solar panels one at a time with mild, non-abrasive cleanser and soft cloth and paper towels. Do not clean with brushes or abrasive cleaners. Connect black lead to COM jack. Connect red test lead to VΩmA jack (except for DC10A range current tests). Use highest range and select downward ranges for voltage to be determined. Do not change the Function selection with test leads attached to circuit. Be careful that there is no voltage or charged capacitors on the circuit before using Ohm function for resistance test. Be careful that current is below the range selected before connecting the DC Ammeter. Turn 'On' meter On/Off switch below Function selector knob. Display backlight button is to the left of Function selection knob. Diode forward Voltage drop connect red probe to anode and black to cathode display in mV (reverse connections display is "1"
Battery Charge Level function is for small 9V or 1.5V batteries only. Remove back of meter case for access to 9V battery and .5A/250V fuse. Work with high voltage circuits can be dangerous. It is recommended that such work be done with a partner who has proper insulated equipment available and understands the job. AC feeds in building can be turned back on when servicer had turned it off, bad switches can bleed power through, insulation may fail, etc. Avoid touching exposed conductors, even when power is "off". Your Portable Port PAL comes with several extra cables and connectors for common applications. Accessory items available include connectors and sockets to fit most brands of scooter, electric bike, lawn and garden equipment, mobility chairs, golf carts, fork lifts, much more. Eoto may change specifications at any time. Eoto members are continually updating and improving the project manual. This Eoto Co-op Project has a few standard features, but is probably the most flexible in actual machine specs. A Port PAL is basically a stand to hold solar/electric generating panels, that are also used for other purposes, such as signage, shelter, etc. Please work with your Accedtor or send email to the Co-op Secretary with your specifications and requirements. We are accepting most applications and custom designing and building to suit your needs, from ground to rooftop applications. Installation may not be available in some locations, but you can join the Co-op and receive design assistance and Eoto standard materials in a kit. There are many predesigned kits ready to buy. We would also love to hear about your needs for possible future Project Channel Development. All Port PALs come with Eoto signs and Co-op member email banners. All members are encouraged to offer information to new perspective members and encouraged to join the Eoto Express Project. These signs are important for letting other members and prospective members know about what you are doing. Use of the email banners is optional. Standard equipment with Port PALs includes the BatteryTuner Tool Kit. Members are encouraged to use this equipment for maintenance and repair of their own equipment, but also to offer service to friends, neighbors, community and spread the knowledge of what can be accomplished with the changing technology. If you need additional signs for business, traffic, etc. We build sizes ranging from tall highway signs, to pedestrian walkway signs. Send an email with your requirements. Power produced by Port PAL Signs often exceeds need of sign lighting, so plan for equipment charging as well. Lighting systems include spot lights, backlights, neon, security and others. Many localities and jurisdictions are easing restrictions on building codes and zoning permit processes when it comes to utilizing solar power. This may also apply to free standing, or attached to buildings, shelter and shed use. Why not put a sign on your roof top air-conditioner shelter? Rough Shelter Single Car - Model #IPPRSSC - is a model with low roof covered by solar panels. The roof is not contiguous, but opens when panels tilt to the sun. This design relieves potential for snow build-up in cold locations, and lets out heat in hot locations. In all locations this model makes maintenance and cleaning of solar electric generating panels easy. Lighter weight and low costs to install, the model is often installed with one back and one side wall or with partial wall or with back wall cabinet only. Commercial & Institutional parking shelters and lots can all use, powered lighting, signs, shelter from sun - send your specs and requirements, let us give you a quote. Store Front Bike Rack - Model #IPPSFBR - hold 10 bicycles while under Rough Shelter. Welcomes Bicyclist to your business and the perfect Eoto Co-op conversation starter. Options include electric bike charging. Store Front Mobility Scooter Parking - again, start the conversation. The Port PAL Rough roof design can define spaces with out closing in the space and air. Panels attach in rows for tilting to the sun and easy cleaning - also easy to set up and remove. Air is let out, and booth can be lower profile and lighter to carry without visitors feeling cramped. Solar electric roof is perfect for shows with limited electrical service. Use your power for fans, lighting, sound systems, etc. When the rain comes, cover entire roof with tarp covers. While excellent for signs, the roof also attracts attention in it's own right. Recruit Co-op members, or rent mobility scooters. Anything that can use electricity is easier to sell! Did you know that a crowd at your convention, fair, event, will need more to drink when it is outside and sunny? Did you know that your Port PAL solar powered refrigeration will cool more drinks when it is sunny? This is one of the Project Channels. Send email with your info. Lot Corner Charger - Model #IPPLCC - Is designed to integrate to most fence types and lot corners for new installations. It can also fit inside existing fences at corners and in-line. Use it to charge electric fences, and for most installations has plenty of power left for fence line and lot video surveillance. Send email with your needs. Use solar power to monitor and avoid freezing at water troughs, monitor feeders, etc. Solar power to keep water bowl thawed, temperature monitors, even ventilation: Did you know that on a sunny day, when you needed that fan the most, your solar generators are producing the most? Model #CPPDK1015 is 10ft.x15ft. with wire roof, no floor, Rough Shelter of solar panels. Waterers, monitors, ventilation, winter dog house, are separate options. Rough Chicken Coop - Model #CPPRCCA1015 - is a model with low cost Chicken Coop. Comes standard with four wire walls with one door. Wire roof, but no floor. Solar panels above tilt in rows to release heat and also are removable in rows for cleaning and to ease moving the coop. 10ft.x15ft. Other sizes available. Combination power cabinet and nesting boxes in different sizes available. Make your coffee and run computers and lights without connection to the grid. Available in many sizes. Store batteries. Park your rechargeable lawn and garden tools safely and conveniently. Model #CPPSS816 - Wooden storage shed with wide door. 8 ft.x 16 ft. Slanted rubber roof with solar panel cover. No floor. Model #CPPGH48 - Has one sliding window with counter sill. One swinging entry door with 2way key lock. Walls, floor and roof of wood. 4 ft.x 8 ft. Roof has rubber roofing with cover of solar panels. Exterior and interior lighting. Options include surveillance and intercom communication, and other monitoring/detection systems.